New in Die Scachtel's Composers series, Neuma Q is a collection of four works by poet and composer Osvaldo Coluccino, a well-known name in experimental electroacoustic music on the international festival circuit. 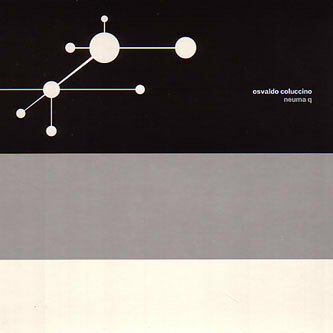 Although the music here is very much grounded in the more challenging and cerebral areas of electronic music, Coluccino's appropriation of relatively familiar elements such as the drone, or processed spatial recordings mean the music here is never too far away from a well established frame of reference. The first track opens up in an erratic, fairly noisy fashion, channelling powerful low-end drones along with scrappier, twitching interference-like sounds. The second piece is a shorter and steadier affair, surfing across a sheet of washed-out, opaque static over four immersive minutes of minimalist concrete sound. The third entry stands out, taking on a more atomised character, exploring noisy sound matter, smashed into particles. This composition is arguably the most academic sounding entry here, taking on an almost Hecker-like level of diligent noise exploration. Finally, the fourth and longest composition on the disc explores the kind of enigmatic sonorities you'd hear from a Francisco Lopez recording - you know it's based on some sort of processing of field recorded sound, but the level of abstraction means you'll never be able to work out quite what it is you're listening to. Whatever it is, it manifests itself as a brooding, steely slab of narrative-free, dark-ambient tonality, modulating and evolving in only the most subtle and unhurried fashion.